Should you eat like a caveman? Supporters of the Paleo Diet say “Yes!” This popular new diet trend focuses on eating the same types of foods our hunter-gatherer ancestors survived on hundreds of thousands of years ago. It’s certainly an intriguing idea, but is it a good one? Here’s a little perspective on the Paleo Diet. 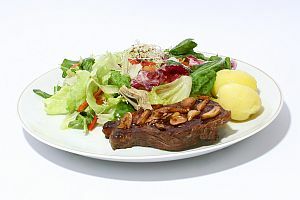 The Paleo Diet is a food plan that attempts to mimic a paleolithic style of eating. Refined sugars, processed foods, legumes, dairy, and grains are all out. Instead, dieters focus on animal meat and products, vegetables, fruits, raw seeds and nuts, and some added fats like avocado and coconut oil. The theory is that by abstaining from the ingredients most common in the modern diet, you can avoid modern health problems like obesity, cardiovascular disease, and diabetes. Just How Healthy Were Our Ancestors? A diet rich in lean meats, vegetables, and healthy fats is absolutely a good idea, but is it really necessary to go as far as proponents of the Paleo Diet suggest? Probably not, especially considering that hunter-gatherers were not exactly paragons of health themselves. While our ancestors were unlikely to suffer from obesity or diabetes, they were extremely susceptible to other problems that may have stemmed from nutritional gaps as well as parasites and infectious diseases. Even more intriguing, a study published in The Lancet found that a very high proportion of hunter-gatherers suffered from atherosclerosis (plaque buildup in the arteries that increases the risk of heart disease and stroke). After comparing 137 mummies from civilizations all over the world, the study found that 47 showed evidence of atherosclerosis. That’s more than one in three. Even though our prehistoric relatives were not as healthy as fans of the Paleo Diet might have you believe, there is no doubt that reducing processed foods and increasing consumption of fruits, vegetables, and lean meats is a healthy switch. The problem, however, is the restrictions required to follow this diet completely. There’s a reason why 95% of diets (including Paleo) fail before a goal weight is reached. Placing heavy restrictions on what you can and can’t eat almost sets you up to fail. With an “all or nothing” approach to dieting, one slip-up can make you feel like a failure, and may prompt you to abandon the diet plan altogether. The Paleo Diet (and other diets like it) can be very difficult to stick with, especially over the long term. While you are very likely to lose weight while you stick to this diet, the pounds will probably return as soon as you return to your normal eating patterns. So what’s the bottom line? The Paleo diet is not a bad idea, but it’s extremely difficult for most people to stick with long-term. Making small adjustments in your eating habits that are compatible with your lifestyle gives you a greater chance for success. Poor hormone regulation, sluggish digestion, chronic pain and inflammation may stand in the way of you achieving your specific health and weight goals. A healthy diet supports your nervous system, and this in turn may help you lose weight and inches. Regaining control of your body’s functions with good posture and efficient communication systems may be your key to long term weight management and success.